In all honesty this project is simple, but time consuming. The tearing and tying took quite a long time and it certainly didn’t help that I spent an extra couple hours driving around trying to find more fabric because I ran short. I think when all is said and done, I probably used about 2 meters of my base off white colour and about .6 meters of the printed fabric (.2 of each). That’s a lot of fabric. Thank goodness I finally broke down and bought a Fabricland membership in September ~ that has paid for itself already! My wreath is large (18″ ring) and very full, but oh so beautiful. I am so happy with the final product and had so much fun designing the finished look. I really wanted an elegant meets rustic look. I purchased regular burlap in its natural colour as well as an off white shade. 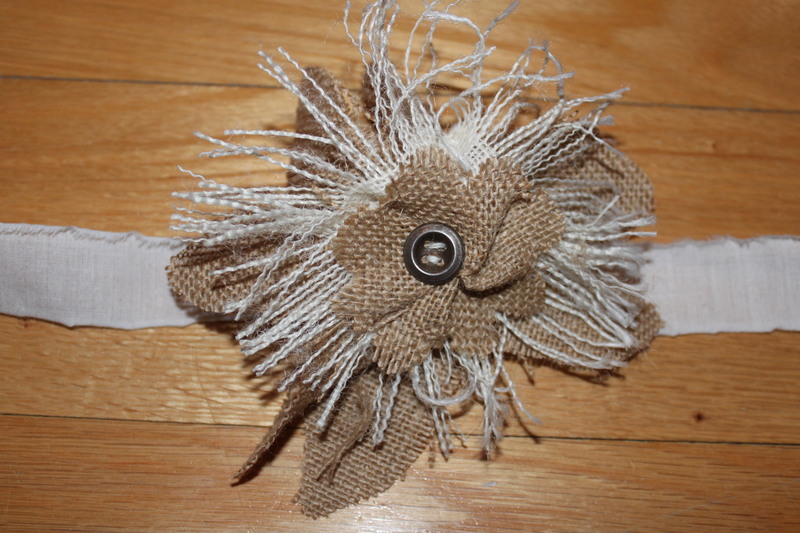 I then googled tutorials for how to make burlap flowers and these are the two I ended up using to make mine. The first video is the tutorial I used to make the main flower for my wreath. I used both colours for this and I found the tutorial pretty easy to follow. I was a bit confused with how to fold the flower with the glued edges touching, but was able to figure it out through trial and a bit of error. Here is my version of this flower. The second tutorial I used was from Craftaholics Anonymous. Linda gave a great tutorial that was super easy to follow and the little rose buds literally took no more than a few minutes to make. I made the bow on the top out of a combination of wire ribbon that I purchased at 90% off last January and a long piece of burlap. I love the natural look of the wire ribbon combined with the texture and colour of the burlap. I added a button to dress it up a bit. I decided to hot glue a piece of extra “rag” fabric to the back of each flower as well as the bow. It was easy to shove the ends through the wreath between the first and second rings and the third and forth rings. This allowed me to pull the ends through and tie the embellishments on. I didn’t want to use glue as I was afraid I would ruin it. This also allows me to remove them and change-up the embellishments for a different holiday or look. Here is a shot of the completed wreath before adding the embellishments. Posted on November 25, 2013 by Cindy Roy •	This entry was posted in All Things Christmas!, Home Decor and tagged Christmas decor, christmas decorations, elegant rag wreath, holiday decor, holiday decorations, how to make a rag wreath, rag wreath. Bookmark the permalink.